Ever played the popular game Cluedo? I’ve never played the actual board game myself but I’ve spent many happy hours playing a wii version and wondering if it was Professor Plum in the study with the knife or Miss Scarlett in the dining room with the lead pipe. However I can now reveal who is the murderer! It was Jae in the living room with her laptop! What an insult! I did not, as El would claim “dunnit”. I have not murdered anyone, though I will admit to sending a few evil thoughts to people who displease me. I do have a crime to confess to though. 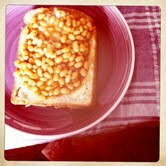 When El went on a sleepover, I used her special purple plate for my beans on toast. April 11, 2012. Tags: Cluedo, crime. Random wisdoms.